When I took my course at the Ballymaloe Cookery School, each morning before class, we gathered in the sunroom for a decadent breakfast. Although there was house-churned butter to lather on soda bread and scones, poached fruit medley, plus a local cheese spread to choose from, the simple raspberry muesli was my favourite. It reminded me of the absolutely lovely Bircher-style muesli I had enjoyed earlier in the year at Mollies in Auckland, NZ. My attempts to recreate the version from Mollies, full of shredded apple and plump raisins, never lived up to the original (I imagine the kitchen crew at Mollies indulged me with some heavy cream, but that’s a guess). When I asked my instructor at Ballymaloe how to make their version, I was pleasantly surprised to learn it’s dead simple, it’s quick (no soaking overnight), and it’s light. It’s also easily customizable, so you can change it up with the seasons to include your favourite fruits. In my version, I substitute maple syrup where Ballymaloe uses honey. Darina Allen, who runs the cookery school, insists that muesli is best when eaten with brown sugar and cream – perhaps she’s been talking to the folks at Mollies. Combine the oats and water in a bowl. Give the mixture a gentle stir and allow to sit for 15-20 minutes. While the oats are soaking, allow the frozen raspberries to start to defrost on the counter. When the water has been absorbed, stir again. You should have a nice soft oat mixture with a little bit of ‘oat milk’, the slightly creamy liquid created by the soaked oats. Mash in the raspberries. 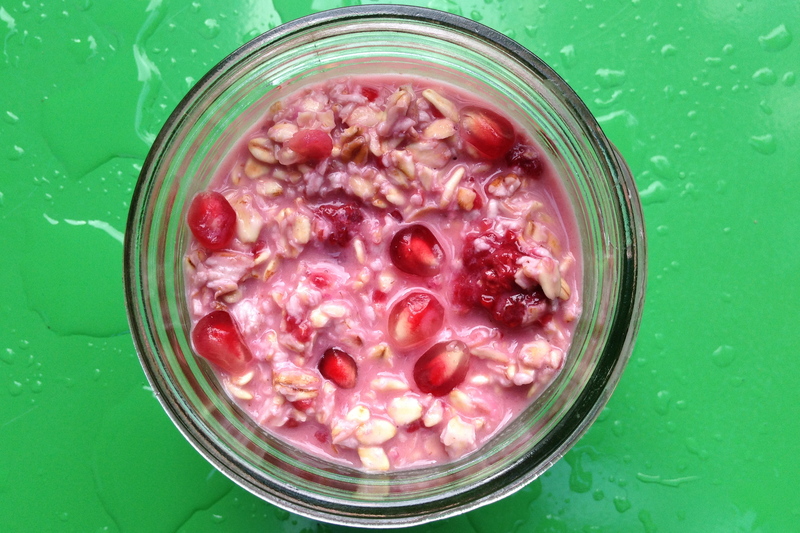 Drizzle with maple syrup – adjust based on how sweet you like your muesli. Add any other seasonal fruit or nuts. Darina Allen would strongly suggest you sprinkle with brown sugar and drizzle with fresh cream. This is one of my favourite sauces. It’s so versatile and so tasty. In Spain, where the sauce is originally from, it’s served many ways – with patatas (fried potatoes) or grilled vegetables or grilled fish. I think it tastes best on the second or third day, after the flavours have had a chance to meld, so if you can, make it a day ahead. But it’s pretty darn good slightly chilled right after it’s made too – I would recommend saving a hunk of bread to wipe out the food processor for a well-earned chef’s taste test. 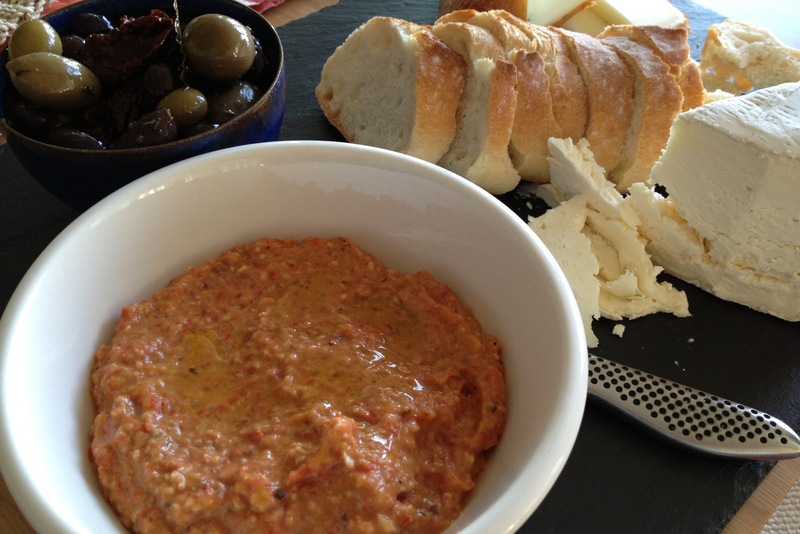 I like to serve romesco sauce as an appetizer dip with fresh crusty bread, lightly drizzled with olive oil and a crack of sea salt, with mixed olives on the side. Or I will toss it with hot pasta, roasted tomatoes and fresh Parmesan for a simple dinner. The origins of this recipe are from the LCBO Food & Drink magazine, but I have made a few adjustments from batch to batch to end up with this version that I like best. Preheat oven to 400°F (200°C). Line a baking tray with sides, or a glass dish, with parchment paper. Cut peppers into quarters. Remove seeds and white pith. Cut tomatoes in half and remove seeds. Place vegetables cut-side down onto baking tray. Add garlic cloves. Drizzle with 2 tbsp of olive oil. Toss garlic to coat with oil. Roast in oven for 30-40 minutes or until soft. Remove from oven and allow to cool down enough that you can handle vegetables to transfer to food processor. While the pepper and tomatoes are roasting, prepare the breadcrumbs and almonds. You can use store-bought breadcrumbs, but you can also take a couple of slices of slightly stale crusty bread (I include the crust, even though many recipes suggest you cut it off) and pulse in the food processor to make your own breadcrumbs. They’ll taste better and don’t take too much work. To toast the almonds, place a pan on the stove top over medium low heat. Spread the almonds in the pan. Every couple of minutes, give the pan a shake to move the almonds around and flip them. You just want to give the almonds a light toast. Transfer almonds to the food processor and pulse to grind into almond crumbs (they should be similar in texture to the bread crumbs). When vegetables are cooled, remove skins from peppers. You can also remove the tomato skins (they will slip right off), but I include the them. Peel the roasted garlic cloves. Transfer peppers, tomatoes and garlic to food processor. Add half the breadcrumbs, all of the almonds, 2 tbsp olive oil, 1 tbsp balsamic vinegar, salt and pepper. Whirl until almost smooth. I like the sauce to have a bit of texture, so it’s okay if you have a bit of grit from the almonds. Add more olive oil if you want the sauce thinner, or more breadcrumbs if you want it thicker. You are looking for a pudding-like texture. Taste. Adjust the salt, pepper and balsamic vinegar as needed. Store in the fridge in a covered container for up to 4 days. It freezes well, so you can freeze any leftovers. And don’t forget to wipe out the food processor for your well-earned sample! When you have fresh herbs on hand, this pesto-like sauce is a quick way to add flavour to many dishes. This version is a bit like Argentinean chimichurri. If you like a little more kick, you can add about ½ tsp red pepper flakes. Or make an Italian-style version and add capers and dollop of mustard. Work with the herbs you have, so play with substituting parsley for the chives. Or add in some arugula for a peppery bite. In a small bowl, combine olive oil, vinegar, limejuice, salt, pepper, and cumin. Allow to rest for 10 minutes. Your next steps will depend on whether or not you are using a food processor. Smash garlic cloves. Peel off papery skin, cut off bottom, and remove the shoot that runs up the center of each clove. Roughly chop chives and cilantro, including stems. Place all into food processor bowl. Add seasoned oil mixture. Pulse until you have a sauce. I like to keep the sauce a little textured so that people can see bits of the herbs. Add a little bit of water if it is too dry. Season with additional salt and pepper to taste. Not to worry if you don’t have a food processor. Mince your garlic cloves (if you have one, get out your garlic press for this). Finely chop your herbs, including some of the cilantro stems. This will be a more rustic sauce, but equally delicious. Add seasoned oil mixture to chopped herbs. Stir to combine. Add a little bit of water if it is too dry. Season with additional salt and pepper to taste. Allow sauce to rest in the fridge for a couple of hours before serving. I love to pair this with grilled flank steak, but it’s also good on grilled vegetables, and on fish or chicken. I’ve never tried it as an accompaniment for a firm cheese, but I bet that would be good too. You don’t need a golden ticket to visit this chocolate factory, but you do have to be able to find it. If you’re not paying attention, you’ll drive right by the Big Tree Farms chocolate production facility, housed in the world’s largest commercial building built of bamboo. Make sure to watch for the big banyan tree, where you’ll turn off the main road, and there, tucked back in the village of Abiansemal, you’ll find Big Tree Farms. We’re here for a tour, to learn about the company, about the building and its unique design, and about the approach to chocolate making that differentiates Big Tree Farms. Of course, we’re hoping to taste some chocolate too. 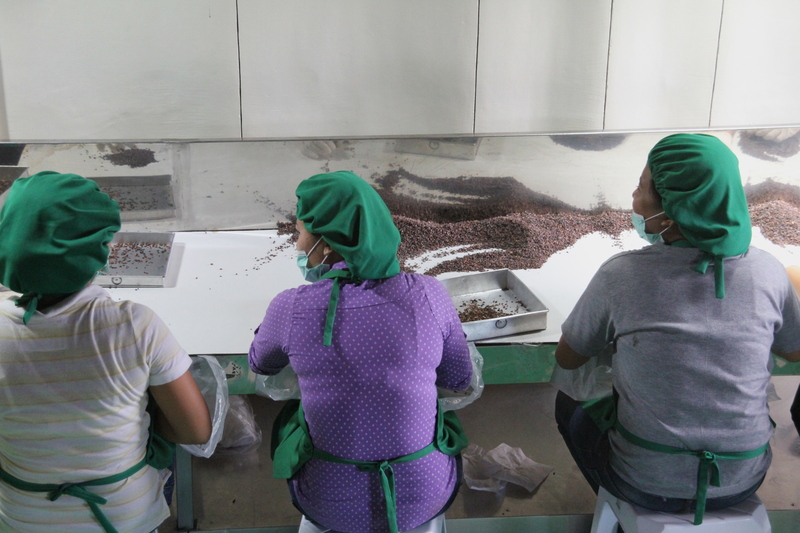 Our friendly and enthusiastic guide, Ningseh, gives us a quick overview of the factory while we enjoy a complimentary warm chocolate drink (although it’s a humid 30+ degrees so we don’t need any further inspiration to warm up). Energized by the chocolate, and dressed in our mandatory ‘oompa loompa’ sanitation hats, we’re now ready to explore the factory. Even though the grand opening took place in November 2011, the factory is still a work in progress. The current building houses a warehouse for raw ingredients, production and packaging facilities, and Big Tree Farm’s Indonesian head office. A retail store, commercial kitchen and café are being built out back to better facilitate consumer interest and tours like the one we’re taking. Designed by an American architect, now relocated to Bali, and built with the guidance of a Balinese Master bamboo builder, it’s an unconventional structure, but it works. The walls are woven from strips of bamboo, allowing air to flow through for natural ventilation, and the third floor atrium with its tented roof is completely open, creating a cavernous loft in the treetops. Production areas all have internal glass windows so everyone can see each other. It’s part of the Big Tree Farms belief in transparency. To make their organic chocolate products, Big Tree Farms works with over 2,000 farmers on the island of Bali, and another 1,000 farmers in Aceh. 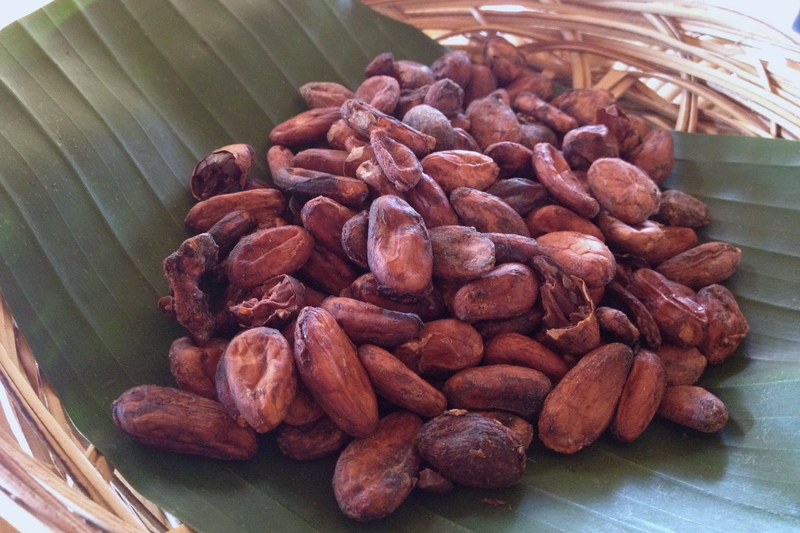 The ‘beans’ (which are actually seeds from the cocoa pod fruit) are harvested, fermented and then dried. To keep their products ‘raw’ (raw foods are thought to maintain more of their nutrients that their cooked counterparts), Big Tree Farms never heats the beans above 45 degrees C. Then the beans are crushed to remove the skins and turn the whole beans into nibs. I tried to do this manually – which Big Tree sometimes does at the request of certain customers – and couldn’t even get one flake of the skin to come off. It takes practice and patience to peel the beans. The nibs are inspected and sorted – by hand – for quality control to ensure all the skin has been removed. 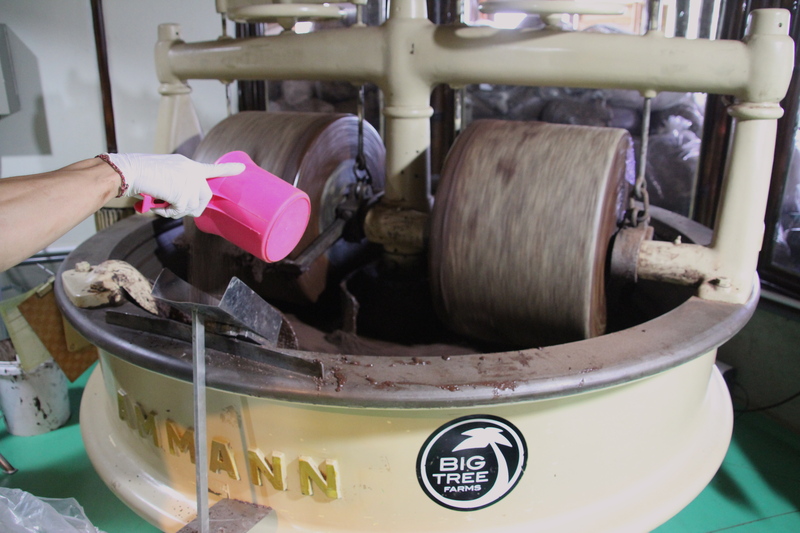 Approved nibs are then pressed for 8 hours to make cocoa powder, and then further refined for 12 hours to create an even smoother paste. From here, the paste is pressed to separate out the excess oils. This is where the cocoa butter you find in lotions comes from. The cocoa paste is mixed with the right balance of oil and sugar and then tempered to prepare it to be transformed into consumer products. 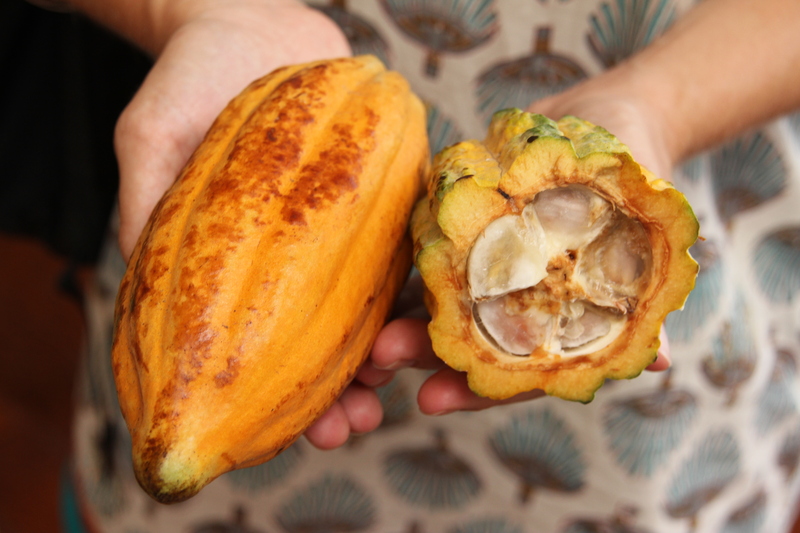 In addition to chocolate bars, Big Tree Farms sells raw cocoa powder, whole cocoa beans, and cocoa nibs. 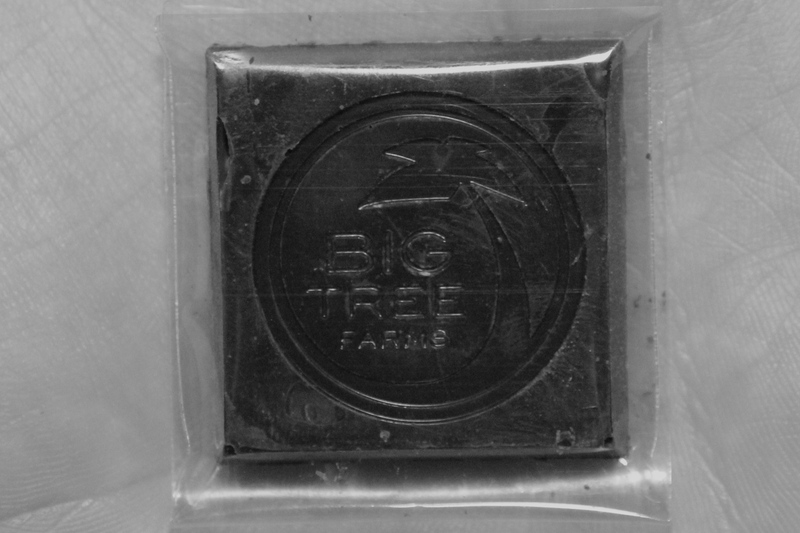 To sweeten the chocolate, Big Tree Farms uses organic coconut palm sugar, another one of their food products. As it is unrefined and has a lower glycemic index, coconut palm sugar is the current darling of nutritionists. Dr. Oz and other high-profile health experts are touting it as the next ‘big ingredient’ and suggesting it is a better choice over traditional refined cane sugar (your basic white sugar used in many commercial food products and one of the targets in the obesity crisis). Organic, raw, nutritious chocolate – is this the ultimate feel-good, guilt-free indulgence? You’ll have to try it and decide for yourself. Big Tree Farms is certainly working hard to give you as many reasons as they can to help you feel good about their sustainable food products. And they might just be having a little fun while doing it. Willy Wonka would be proud. Here is a recipe from Big Tree Farms for their Spicy Morning of the World hot cocoa drink. This is the Jamu of Cacao that gets our blood flowing in the morning. Morning elixirs are an important for the majority of we humans, everywhere. Every culture, in their own way, greats the morning with some kind of ritual that bridges the dream time to the awake time. Our morning ritual uses our cold pressed raw cacao powder, our SweetTree coconut palm sugar and various spices that not only awakes the mind, but also invigorates the body. 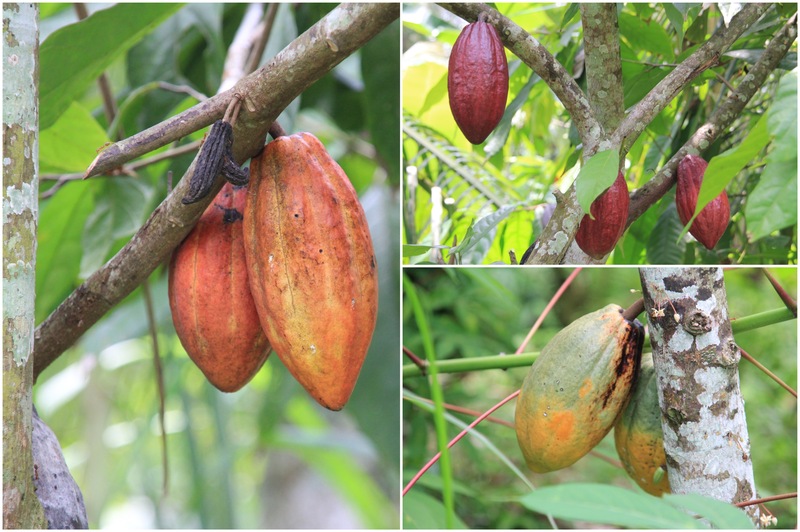 Cacao is a stimulant in that it is one of the best vasodilators in the world, which means it expands your veins, allowing more oxygen to flow into your body. So your cells feel alive and awake without the jittery caffeine manky manky. Stir the above ingredients in an oversized mug that requires you to use 2 hands to bring it to your lips. After all, this is a morning ritual and using two hands tends to make you appreciate the moment all the more. We love using coconut milk to give it a little bit of extra richness and mouth feel, but you can you use whatever kind of milk you prefer. I spent four months living in Barcelona as part of an educational exchange during University. It was a wonderful learning experience. But, more enjoyably, it was a wonderful eating experience. I fell in love with the array of ingredients on offer at markets like La Boqueria, with tapas-style dining, with indulgences like chocolate con churros. 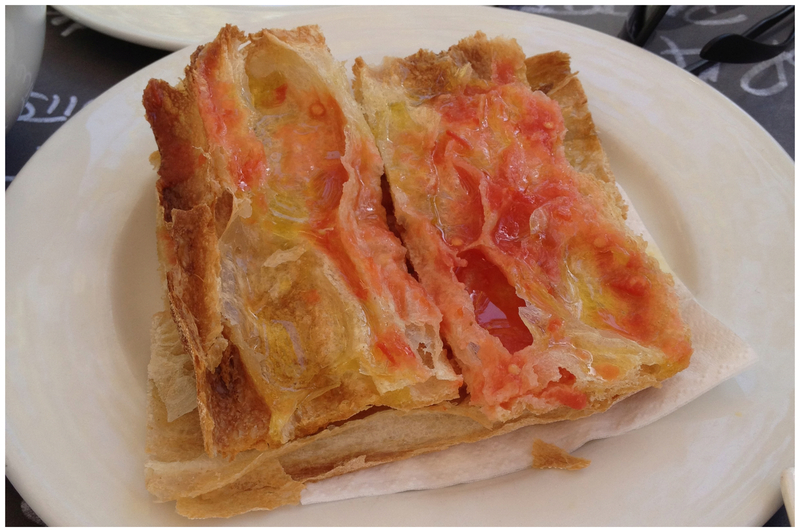 But the dish I loved most was pan con tomate, a very simple preparation of toasted bread with tomato. It is often served in restaurants instead of bread and butter like we are used to at home, or offered as an inexpensive tapa. In the summertime, when Ontario tomatoes are at their peak, this is a wonderful way to showcase fresh tomatoes (and you can just pretend you are sitting in the sun on La Rambla). There are so many tomato varieties. And with all the heirloom options that are being resurrected, the selection is only getting greater. You want to find a tomato that is nice and fleshy – not watery – or the tomato water will make the bread soggy. Look for vine-ripened or field tomatoes that are not too heavy when you pick them up. In a pinch you can certainly use roma (plum) tomatoes. Cut the tomatoes in half. If there is a lot of water, shake some of it out over the sink. Just before you are ready to serve, toast the bread. Immediately after you remove the bread from the toaster, wipe the cut side of the garlic clove across the entire surface of the toast. This will give a hint of garlic flavour. Take a tomato half and rub the cut side across the toast, giving it some good pressure as you go to spread the tomato flesh onto the bread. You should be creating a light ‘paste’ of tomato. If my tomatoes are not quite ripe enough, I sometimes ‘cheat’ and use a box grater to create a tomato pulp that can be spread on the toast. Just watch your fingers as you grate the tomato. Once each slice is dressed with tomato, drizzle with extra virgin olive oil. Top with salt and pepper. Although winter weather often makes me want to hibernate, a picnic in the snow is an enticing reason to get outside. Pack up some savoury bread pudding made in muffin cups for individual, easily portable servings; a thermos full of this squash and apple soup; and perhaps an almond butter oatmeal cookie or two for dessert and you have yourself an al fresco feast. 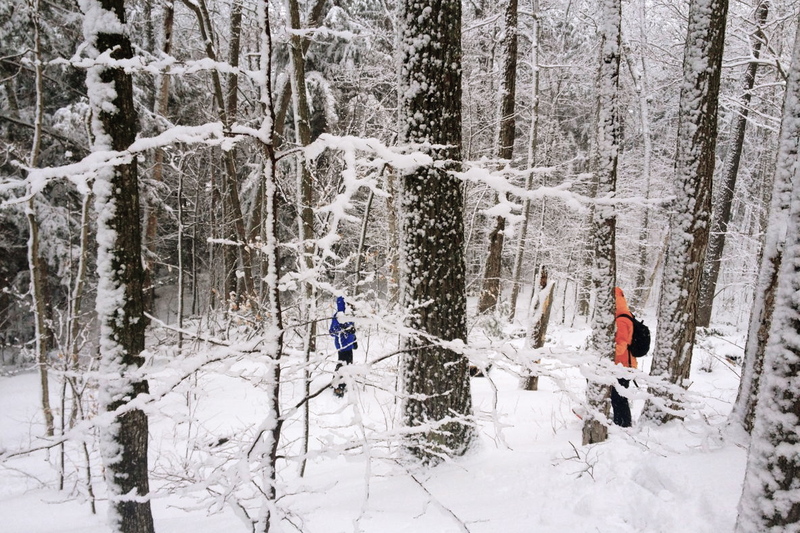 A few years ago, some girlfriends and I spent an afternoon in Muskoka, snowshoeing out on Three Mile Lake, scouting for the perfect picnic spot. 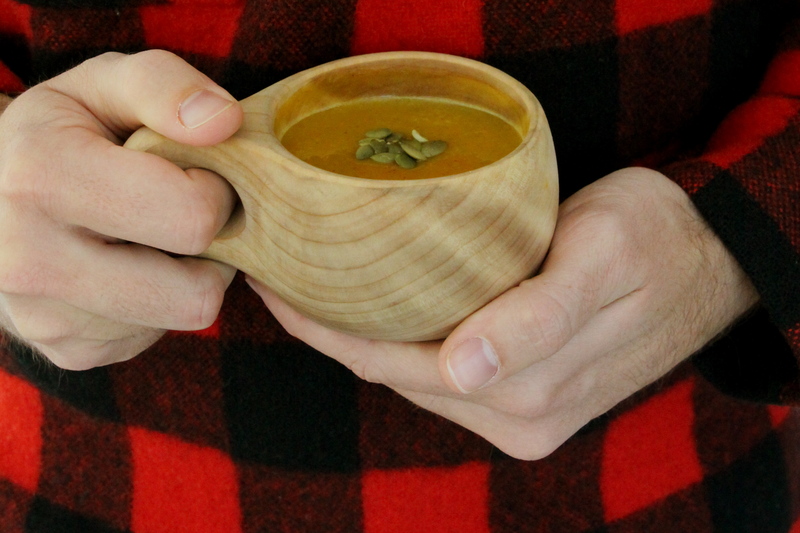 Once we found it, we carved ourselves some ‘seats’ in the snow and enjoyed a mug full of this soup. Even when I am not preparing for a winter picnic, I like to make a big pot of soup on a Sunday afternoon and then I have it for the week. It freezes well, so you can pack as individual servings and then defrost for a quick lunch or dinner. Make this soup spicier if you like, or eliminate the cayenne altogether if you prefer it milder. Sometimes I will add a dash of maple syrup to the pureed soup, just for a little Canadian flare. tip: To make whole squash easier to work with, cut in half and remove seeds with a spoon or ice cream scoop. Place squash cut side down on baking sheet lined with tin foil. Bake in 400F oven for 10 minutes. Allow to cool. This softens the squash and means less work to peel it. Melt butter over medium heat in large pot (or heat oil if using instead). Add the onion and cook until really softened, about 15-20 minutes. The longer cooking time for the onions is worth it, so wait it out. Add cinnamon, allspice and cayenne and stir into softened onions. You can always add more cayenne later so best not to overdo it in the beginning (I learned this the hard way!). Add the squash and apples to put and toss to combine with onions and spices. Add brown sugar. Pour 4 cups of the vegetable stock into the pot. Add fresh thyme. Simmer for 20 minutes. Using a fork, test to see if squash and apple are fully softened. Both should be tender enough to easily insert fork all the way through. Continue to simmer for another 5-10 minutes if squash and apple are not fully cooked. Remove from heat. Blend until smooth with a hand blender. You can adjust thickness with remaining vegetable stock (or water). Add more cayenne if you like a little more spice. Season to taste with salt and pepper. Return to heat to warm before serving. Spoon soup into individuals bowls. Sprinkle with toasted pumpkin seeds. You can buy sundried tomatoes, or you can make these. Once you make your first batch, you’ll be hooked. 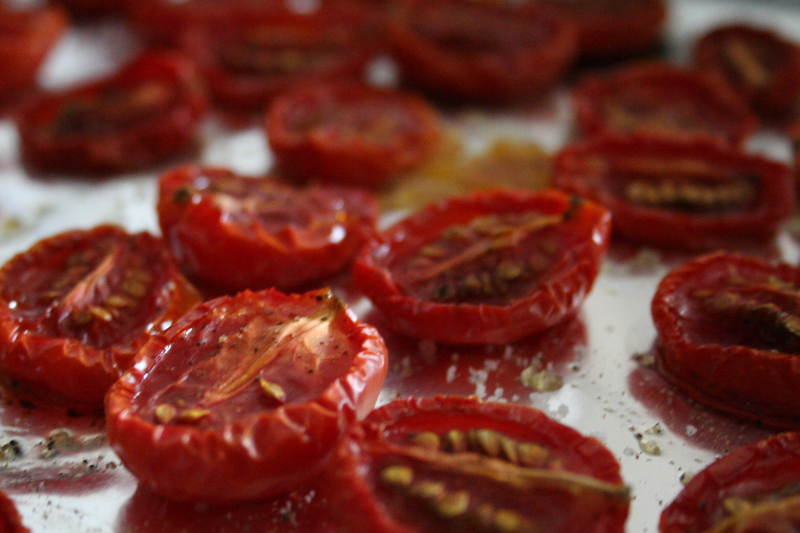 Slow roasting tomatoes like this is a great way to capture the taste of summer. You can store them in oil in the fridge for a week weeks. And the oil will also be delicious. These are perfect for adding to salads and pastas, or serving alongside a cheese and charcuterie selection. And I like to add them to mac n cheese as well. Line baking sheet with tin foil. Cut cherry or grape tomatoes in half. Place cut-side up on lined baking sheet. Sprinkle with salt and pepper. In small bowl, combine minced garlic (a garlic press is particularly helpful here) and olive oil. Pour garlic oil mixture over tomatoes. Slow roast in the oven until edges start to crinkle and wither, approximately 45 minutes, depending on size of tomatoes. Transfer to a glass jar to store. Pour the oil left in the roasting pan into the jar. It will be full of flavour.